This ball is deadly! 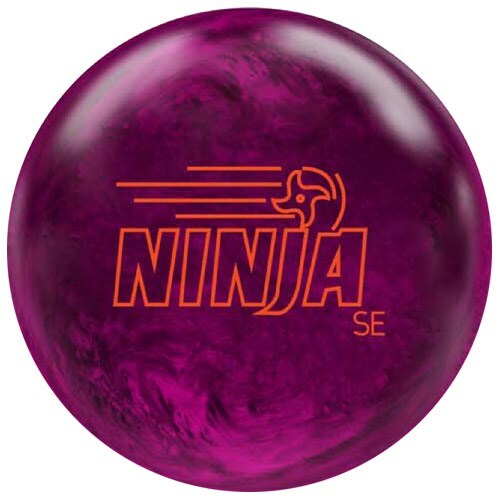 The AMF Ninja SE Pearl is part of their Vintage line of bowling balls. This ball features the Shredder symmetric core that is covered with an F70 pearl coverstock and is finished with a 1500 grit polish. This combination provides a great option for lane transitions or breakdown. The Pearl version of this ball is clean through the fronts while retaining power for the backend motion. This ball is ideal on medium to medium heavy oil conditions. The Ninja Pearl SE is the perfect complement to the original Ninja SE as the lanes transition. Cleaner in the front of the lane, this ball stores more energy to create a strong backend motion. breakpoint. The pearl F70 coverstock is going to handle most medium and heavy oil conditions as the lanes open up. The Ninja SE Pearl does exactly as advertised. The ball is clean through the front part of the lane, it has more length than the original Ninja SE and with a faster response to friction, creates a more angular motion down the lane without being skid-flip or going sideways. The combination of the low RG Shredder symmetric core and the F70 pearl covestock worked great for me on our typical house shot (Kegel Main Street, 41') The Ninja SE Pearl provided me the perfect balance of length and angularity. The ball never wanted to hook to early but at the same time the Ninja SE Pearl never skid too much. For a low rev rate, medium speed bowler like me, this is money. As you can see in the video, I tried playing from different angles and the ball gave me a great look. I started laying the ball down around second arrow with 5 at the breakpoint and I was able to miss a couple of boards both sides and the ball offered a big margin of error. Misses inside resulted in the ball wanting to push the ball down the lane, holding its line to the pocket. Misses outside and the ball jumped hard to the right, sometimes leaving corner pins and 9 pins. When I slowed down and missed left my target, the ball went through the nose, so as long as I kept my regular speed, the Ninja SE Pearl gave me a consistent reaction from shot to shot. The Ninja SE Pearl is a versatile ball. It handles oil better than I thought and it has a strong, but predictable backend motion. For a pearl this is something I really appreciate since most of the time I get some over/under on fresh while this ball was able to give me the same shape and the same length over and over again. When the lane started to transition, I was able to play as deep as third arrow with this ball, and the ball always found its way to the pocket. The Ninja SE offered me lots of recovery when I had to move inside and play steeper angles. Overall I feel like this ball is the perfect complement to the Ninja SE and a great ball when you need more length and more shape down the lane. I can see myself using the Ninja SE Pearl when the lanes transition or break down and I need to move inside. I like how angular this ball is without being a skid-flip reaction. It has a strong, but controlled backend motion. It will definitely fit into a lot of bowling styles. Low speed, low rev bowlers bowlers will get easy length and a strong shape down the lane and high rev, high speed bowlers will be able to use the Ninja SE Pearl in different part of the lanes.